We champion the advancement of women across all communication disciplines by recognizing excellence and promoting leadership. Each year we celebrate our exceptional members, and future communications professionals with scholarships and awards. Pictured: Our 2016 winner and fellow member. Every year the AWC Seattle Professional Chapter awards scholarships to outstanding communications students attending Washington state colleges and universities. You can read about past winners on our blog or view the list of scholarship recipients here. Information about the 2019 Scholarship: This year AWC Seattle is offering TWO scholarships of $2,500. These scholarships are open to any woman or man, who is studying communications and will be a junior or senior at a Washington 4-year college or university beginning Fall of 2019. The application deadline date for this year is April 15, 2019. Download the application packet here. From left, 2016 Georgina Winner Dana Van Nest with 2015 winner Connie Mennie. Established in 1976, the Georgina MacDougall Davis Founder’s Award, affectionately nicknamed the “Georgina,” is named after the University of Washington journalism student who founded the Theta Sigma Phi journalism society in 1909, which would later become the Association for Women in Communications. 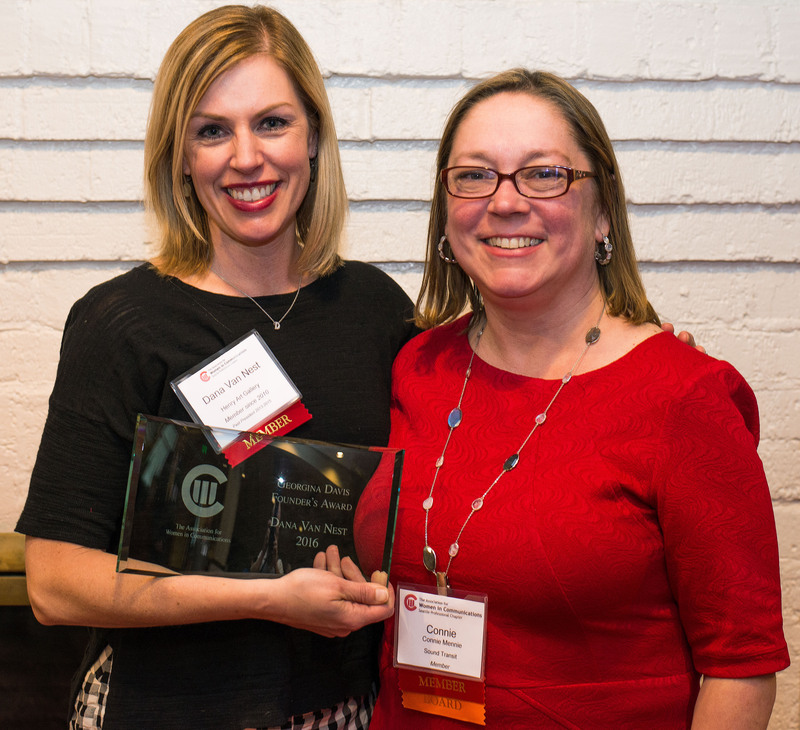 The Founder’s Award is given annually to a Seattle Chapter member who consistently exhibits the highest ethics, professional excellence and personal commitment in everything she does. Read about past recipients on our blog or view the full list of winners here. The Seattle Star award honors a chapter member whose exceptional volunteer work within the last year has greatly benefited AWC Seattle. Examples may include expanding the range or adding value to the chapter’s member benefits and/or bringing increased public attention to the chapter’s mission, programs and services. For information about AWC national awards, visit the AWC national website.